The opening scenes from Paddington, the new film about the eponymous English toy bear called, well, Paddington, appropriately enough, has some incredibly gorgeous and glorious animation. When a bear first appears, it’s as if every single whisker and individual hair of his fur is alive and moving, gracefully flowing even. The animated movement of the bear and the intermix of animation of real live actors is just about faultless and the filmmakers have contributed some marvelous bits of magic as well, such as a doll’s house that reveals the house Paddington lives in and shows what is going on in the other rooms when the doors swing open, or a wall with paintings of trees on it with leaves that flutter away when the weather, symbolically, changes inside the house. The movie, with a screenplay by Hamish McColl and the director Paul King (based on the character created by Michael Bond) is also witty. In fact, it’s often very witty. It’s almost a cliché that English films are going to outwit their American counterparts these days. It just seems to be part of the British character that they can’t escape. In many ways, there’s nothing really that wrong with Paddington. It does what it is supposed to do and has some more than delightful moments and I saw it in a theater full of kids and they seemed pretty riveted by what was going on on screen. At the same time, I did wish that there would have been a bit more tension and forward momentum and a deeper emotional connection to everything that was taking place up there. It begins by borrowing the best of Disney’s approach to children’s films: with death. And after all, this isn’t that unwise a way to start since there’s no place to go but up afterwards. Yes, at the beginning of the movie, a young bear in Peru experiences the sudden passing of his beloved Uncle, so his Aunt sends him to London to hopefully find the explorer who they had met years earlier and who had told them, with no polite irony, to look him up if they were ever in his part of the world. And this daunting young bear does indeed find his way to England via stowing away on a ship, eventually ending up in the Underground, specifically Paddington station, where he hopes to be taken in by a family in the same way children were often taken in during World War II. Now, the likelihood of this seems pretty hopeless for awhile until the Brown family, father Henry, mother Mary, daughter Judy and son Jonathan, pass by and big hearted Mary can’t help by stop and ask the young bear whether he needs any help. The Browns, reluctantly on Henry and Judy’s part, enthusiastically on Mary and Jonathan’s, take him home and give him a name: Paddington. The issues with the movie have to do with it possibly trying to do just a bit too much. It’s first an origin story (we see how Paddington gets to England and eventually adopts his trademarked Peruvian red hat and blue duffel coat, as well as a police helmet at one point, and becomes nearly addicted to marmalade); it’s also a story about how a dysfunctional family becomes functional again through Paddington’s influence; and then it becomes a melodrama about an evil scientist who works at the National Museum who wants to abduct Paddington and stuff him for an exhibit. In other words, it’s sort of like Mary Poppins, but with Cruella De Vil thrown in for added good measure. And this may be just one too many through lines for the story to incorporate to allow each one to be fully dramatized in as satisfactory manner as one might wish. In the opening, the death of Paddington’s uncle is a bit too bland to really make the kids scream in nightmarish terror (as opposed to Bambi, say). The Brown family is about as dysfunctional as the Andersons on Father Knows Best, and their changes of heart are also a tad lightweight. And there is a huge flaw in the plot concerning the scientist, Millicent. Her father was the explorer who first found the talking bears. He didn’t bring one back, so he was ridiculed and thrown out of the explorer’s society over his claims of what he found, but couldn’t prove. Millicent hopes to salvage her father’s name by abducting Paddington and taxidermying him. The problem is that once she stuffs Paddington, he won’t be able to talk, which means there won’t be any proof that the type of bear her father claimed to have found was found. It’s not that the film is boring. I don’t want to suggest that. It’s great fun at times and very clever. It’s just that it’s just a bit…well, above average and no more than that and at other times almost feels like an hour and half marketing tool and product placement for the original toy. But the acting is marvelous. 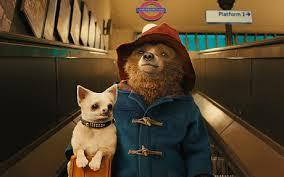 Ben Whishaw of Perfume and Cloud Atlas voices Paddington and is quite adorable. But it’s the actors portraying the Brown family that really sell the show. Sally Hawkins of Happy-Go-Lucky and Blue Jasmine plays Mary with so much enthusiastic cheerfulness you want to go to Paddington station hoping she’ll take you home as well. Hugh Bonneville, of Downton Abbey, plays Henry with a nice humorous stiff upper lip, looking somewhat like Colin Firth’s slightly older brother. Neither character may be quite as interesting as the parents in Mary Poppins, but by god, Hawkins and Bonneville sell the whole thing as if it were Restoration Comedy so you don’t care too much. The cast is filled out with Nicole Kidman in not quite stiletto heels and faux leather as Millicent (to quote a character in The Producers, “Love it”). She’s fine, but it’s a role just about anybody could do and she pretty much plays it that way. Much better is Peter Capaldi, the new Dr. Who, as a Mr. Wilson type neighbor who becomes involved with Millicent; Matt Lucas as a cabbie who also becomes involved, but in a different way, with Millicent; and Geoffrey Palmer of As Time Goes By as the “there’ll always be an England” head of the explorer’s society. Thank god for British screenwriters. ON a bust of Shakespeare sitting amidst a menagerie of stuffed animals.